Gary Hastings is an exceptionally talented flute player. Originally from East Belfast he learned to play bagpipes in the local Boys’ Brigade band. He later got swept up in the traditional music revival while studying in Coleraine, influenced by legendary musicians Cathal McConnell, Len Graham, Joe Holmes, Mick Hoy and Eddie Duffy. While completing a degree in Irish Studies he researched the playing of the fife and the Lambeg drum which was published as a book in 2003. A fluent Irish speaker, a strong promoter of the shared tradition of Irish music, a man of great warmth and humour, the ven Gary Hastings is currently the Rector at St Nicholas Collegiate Church Galway. Grew up in a musical family in Miltown Malbay. Started on the tin whistle and then took up the concertina. Finished the BA Irish Music& Dance in UL. Have travelled the world playing and teaching and now teach weekly all over Clare. Musical families are often the backbone of multi-generational continuity within that global community, and no musical family today is more impressive in upholding the best principles of the tradition than the Mulcahys of Abbeyfeale, West Limerick. Mick, Michelle and Louise Mulcahy play a dazzling array of instruments between them but it's the sweetness and tunefulness of their ensemble playing that is most striking. 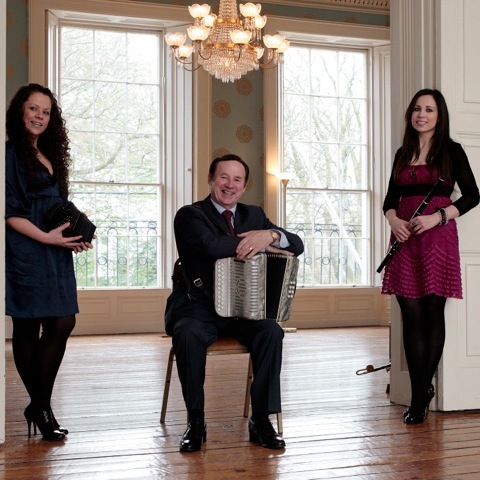 Their latest album from record label Chló Iar Chonnachta titled 'Reelin' in Tradition' has received worldwide acclaim, an album full of soulful traditional music rooted in the West Limerick, Sliabh Luachra and Clare tradition. Mick Mulcahy is a living legend in Irish accordion and melodeon playing, with a rare repertoire of old tunes which he plays in a highly distinctive style, a style of personal touch which distinguishes the work of the true traditional musician, a touch which has been passed down to his two daughters Michelle and Louise. Louises debut album ‘ Tuning the Road’ was released earlier this year and has received worldwide acclaim as has her sister Michelle's harp album ‘Suaimhneas'.Mick, Louise and Michelle have performed at many festivals worldwide and are much sought after tutors aswell as performers. Each if their albums have featured in the top five traditional albums in the United States. As a family they have toured extensively throughout Europe, America, Asia, New Zealand and Australia. Shane Mulchrone and Heather Cole-Mullen explore the traditional music of North Connacht on fiddle, banjo, melodeon and song. Musicians since childhood, they have learned their music from well-respected traditional musicians on both sides of the Atlantic, including John Carty, John Gannon, Kevin Henry, and Rosie Stewart. They have been featured on television and radio, and have performed and taught at numerous summer schools and workshops both at home and abroad. They began playing together regularly in 2012, and since then they have performed together around Ireland, the U.S.A., and Cuba. Shane Mulchrone is from near Ballina, Co. Mayo and has been playing the banjo for over 20 years. His early tutors included John Carty and Tommy Finn, and his music is additionally influenced by the local musicians of Mayo and Sligo. He has taught at numerous summer schools and workshops around the country and abroad, including the Joe Mooney Summer School, Scoil Acla, and Scoil Éigse at Fleadh Cheoil na hÉireann. He has featured on television and radio and performed internationally in Europe, America and Cuba. Shane plays regularly at sessions and festivals around the country and is in the process of completing his highly-anticipated debut CD. Heather Cole-Mullen grew up outside of Boston and began playing violin at 4 years of age. She was raised on New England contra dancing and music and began playing Irish music at 15. She learned Irish fiddle primarily from George Keith, but also studied briefly with Tommy Peoples, who was based in Boston at the time. She began learning accordion a few years later and her music is strongly influenced by the Gannon family, originally from Connemara. She spent several years in Chicago, where she met Kevin Henry and Albert Neary, among many others, and became interested in music from the North Mayo/South Sligo area where she now resides. Heather hosts the Irish music radio program ‘From the Shamrock Shore’ on the Louisiana station KRVS and has been featured on television and radio in Ireland and America. She has performed and taught in the U.S.A, Europe, and Cuba.